Our spray division consists of Rears 1000 gallon sprayers, and we also have the "Hurricane" type sprayer available upon request. The Hurricane sprayer is superb for large trees where dispersal is a challenge. 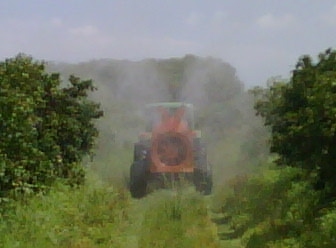 Each sprayer is pulled by a four wheel drive tractor and has the capability to utilize seeing-eyes. We have 13 available, so whenever one is needed we can calibrate it to whatever speed, GPA, width or height whenever the customer needs it. Our Spray Division Application Manager is Reid Baker, he has over 30 years experience in the spraying division and knows the business very well. Our operators have several years experience and have received Global GAP Training.